By rights Tatyana ought not to be alive today. Along with the other residents of the red-brick housing block on Novosyolov Street in the Russian city of Ryazan, she should have died with husband and son on Sept 23, 1999. At 5.30 that morning three sacks of high explosive hidden in the basement of their building were set to blow up. The explosion would have brought down the block. "Of course we're lucky to be here," said Tatyana, 39, in the hallway of her building this week. She was too scared to give her surname. "They had decided to blow up the building and we would all have died. Even today I shiver when I think about it." More than 240 other Russians were less fortunate. They died that autumn in a wave of bombings that destroyed three blocks of flats, two in Moscow and one in the town of Volgodonsk. The Russian authorities were swift to lay the blame at the door of Chechen separatists. But no supporting evidence has emerged. Two men from the Caucasus were convicted of involvement after a closed trial this year, but it was widely denounced as a charade. Instead a growing body of proof has surfaced that links the bombings, and the Ryazan incident in particular, to the FSB - the revamped KGB. Independent investigators, including several MPs, who have sought to look into the case have been intimidated, arrested or beaten. Analysts and investigators claim that President Vladimir Putin, who was FSB chief until August of that year and subsequently prime minister, must know the truth. Lilia Shevtsova, a senior associate with the Carnegie Endowment for International Peace, said: "He would know not just what happened but who the suspects were. The truth will not damage him because it won't be told until after he is gone." 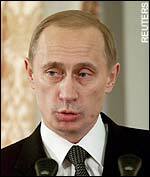 The 1999 bombings proved to be Mr Putin's political making. He positioned himself as a strongman who would crush the Chechen rebels and restore order to the ailing country. Riding a wave of nationalist fervour, in eight months he went from being a virtual political unknown to winning the presidency by an easy margin. Now, after winning nearly complete control over parliament in December and installing a loyal new cabinet days before tomorrow's presidential election, Mr Putin is poised to seal another four years at Russia's helm. In Novosyolov Street the day before the bomb was due to detonate, residents noticed a white Lada parked with a man sitting in the back and a woman standing nervously by the front door. Then another man emerged from the cellar and the three drove away. The residents called the police who found the bomb - three sacks of hexogene, a military explosive used in the other attacks that autumn. The railway station and airport were cordoned off and roadblocks set up. To general approval, Mr Putin announced that Russian planes had begun strafing Grozny, the Chechen capital. That evening the bombers made a mistake. Using a public telephone one of them called a number in Moscow for instructions, saying it was impossible to leave the city undetected. An operator traced the call. The number called belonged to the FSB. Shortly afterwards the two men were arrested. Each produced documents showing that he worked for the FSB. Later an order came down from Moscow ordering the local police release them. The next day Nikolai Patrushev, the head of the FSB, announced that the entire thing had been a training drill to raise public awareness. The white substance was not hexogene, he said, but sugar. The residents who called the police and the telephone operator were each given a colour television to reward them for their vigilance. For a while the controversy refused to die down. Boris Berezovsky, the exiled tycoon and a bitter enemy of Mr Putin, sponsored a film and a book about the incident but both were confiscated by Russian authorities. A human rights activist, Veniamin Ioffe, who tried to show the film in St Petersburg was beaten up and later died. In 2002 several liberals, including the MPs Ivan Rybakin and Sergei Yushenkov, set up a citizens' commission to investigate the bombings. On April 17 last year, Mr Yushenkov was shot dead outside his home. In July, another MP and commission member died mysteriously after alleged food poisoning. A third commission member was beaten unconscious in the lift of his building. Last December, Mr Rybakin lost his seat in the State Duma. He has now all but given up on the investigation. "The men behind this were definitely FSB employees," he told the Telegraph. "Whether they got their orders from the very top, or were a criminal grouping inside the organisation, is impossible to say. "Since they are guarding this so carefully I am afraid there is something really horrible there. As for Putin, its possible he didn't know at the time. But he certainly knows the truth now, better than anyone." Tatyana said: "We still don't know who is guilty. We probably never will. Life is hard here and after a while we stopped asking. I'm sorry to say it, but that's the Russian way."